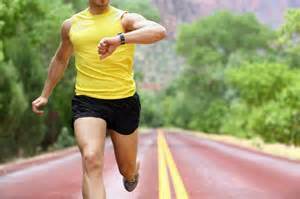 Add sprint intervals into your walking, jogging or running workout. Find a 50-100 yard path that allows you to perform regular timed sprint repeats. After a sufficient warm up of 8-10 minutes, sprint your time trial for a base interval. Repeat the intervals as long as you can log a decreased time each one. All-out intervals challenge your cardiovascular system, and your muscles, all in one time-efficient workout. Perform your sprint workout once each week to allow recovery of your muscles. This workout is for intermediate/advanced exercise without injury concerns. For Core and Cardio- Meet Mountain Climbers! If you’re looking for a multi-beneficial exercise to add into your routine, meet Mountain Climbers! With core and cardio benefits, mountain climbers challenge the stabilizing muscles of your abdominals as well as require many muscles to work together at the same time resulting in elevated heart rate. Begin with 10-20 repetitions, adjusting the technique to your desired intensity. Mountain climbers are for intermediate exercisers, without injury. Begin in a plank position on the floor. Place your hands flat on the floor, directly below your shoulders. Place your toes on the floor, with your body straight and parallel to the floor. Maintaining proper spinal alignment, hop your right foot up toward your right hand, briefly touch your right foot (toes only) to the floor. Next at the same time, return your right foot to starting position and hop your left foot up toward your left hand, briefly touch your left foot to the floor, then return to your starting position. Repeat alternating until all reps are completed.